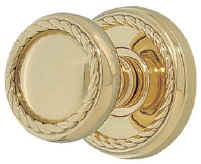 Solid Brass Knobsets - Sold as complete locksets, knob/rosette assemblies are provided for both sides of the door, and passage/privacy sets include a latch, faceplate and strikeplate. These beautifully modeled designs are forged from red hot brass. 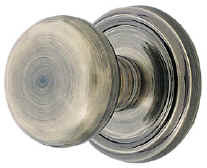 Each Knob and rosette is hand polished and expertly finished. Support springs are factory assembled behind each passage and privacy rosette. The heavy duty latch has a cast body and a solid brass nose.